The Ulster American Folk Park is an open-air museum that focuses on the large-scale emigration from Ulster to America in the 18th and 19th centuries, and is the biggest of its kind in Europe. Displays illustrate the everyday life of the emigrants through reconstructed original and replica buildings, a full-size replica of a sailing ship, and daily demonstrations of printing, cooking, spinning, and blacksmithing practices. There is also a fascinating indoor museum and a dockside gallery. The park hosts regular temporary exhibitions, some of which are fascinating and so popular that they stay up for years, like the Titanic exhibition, which looks at the Irish immigrants who sailed on the famous ship. The park also hosts a number of events, including popular music festivals such as the Appalachian and Bluegrass Music Festival. Admission costs increase on days when the park is hosting major events and travellers should check the official website to see what's on during their visit. 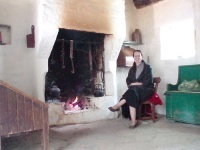 The park gives visitors a taste of what life was really like for the Irish at home and after making the journey to America over the past three centuries, allowing travellers to stroll through history at their own pace and see the buildings, clothes, and crafts which sustained daily life. As it is an open-air museum weather is a factor and visitors should come prepared when it is raining. Address: 2 Mellon Rd, Omagh, UK. Transport: Ulsterbus Express 273 will take visitors to the park on its route from Belfast to Derry. Opening times: Tuesday to Sunday, from 10am to 4pm. Closed on Mondays. Admission: Adult: £9. Children: £5.50.